Is anxiety making you feel overwhelmed? Are you often worried, fearful, or anxious? Anxiety treatments are very effective. I can help you feel better and enjoy life again. When you feel overwhelmed and stressed, life’s challenges, big or small, are a lot harder to manage. “I have to prepare my paper/document for tomorrow. I keep trying to get it done but I don’t know what to put in and what to leave out. I don’t want to miss anything. What if I don’t do well or if my boss/teacher doesn’t get what I am trying to say? They might think I don’t know what I am doing or talking about”. Maybe you have similar thoughts that race around your head? What does “worry’ look like to you? Worry usually involves thoughts about negative events that might happen in the future or sometimes about things that you have done or said in the past that you wish you had handled differently and now are concerned with what other people think. Anxiety treatment can help. You do not need to continue to feel this way. Do I worry a lot more than other people do? Do people tell me that I worry too much? Do I worry even when everything is OK? Do I often try to keep busy or distract myself as a way to avoid worrying? Is it very difficult for me to stop worrying once I start? Do I worry excessively about things that are unlikely to happen, or feel tense and anxious all day long with no real reason? Everyone gets anxious sometimes, but if your worries and fears are so frequent that they interfere with your ability to function and relax, you may have an anxiety disorder. Anxiety Disorders affect about 40 million American adults (about 18%) and causing them to be filled with fearfulness and uncertainty. Unlike the relatively mild, brief anxiety caused by a stressful event (such as speaking in public or a first date), anxiety disorders are chronic and can really effect your quality of life. A large, recent survey of teenagers reported that about 8 percent of teens ages 13-18 have an anxiety disorder, however, only 18 percent received mental health care. This is such a shame as anxiety treatment using talk therapy or counseling is very effective. 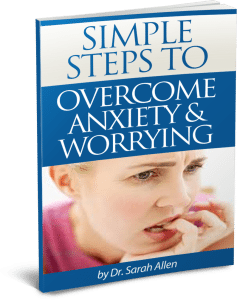 Why keep struggling with worry when anxiety is very treatable? Through proven, effective therapy methods and 20 years of experience Dr. Allen’s anxiety treatment gets quickly to the root of the problem and uses a compassionate, problem-solving approach to identify and treat the issues that are causing you to feel overwhelmed and stressed. So Why Do People Get Anxious? Research is looking at how brain chemicals effect your emotions and how your genes may give you at a predisposition to getting anxiety. We often see that worrying runs in the family. I think, and many psychologists agree, that it is a mix of DNA, your environment and the current stressors you are experiencing, as well as brain chemistry that affect whether you get it or not. Anyone can develop anxiety too and at any age. When I talk with my clients and ask them about their first memory of experiencing feeling anxious, they often trace it back to late childhood or teenage years. Others link it to major life events such as going off to college or becoming a parent for the first time. It is also important to examine whether anxiety co-exists with other issues such as depression, ADHD or addictions. Some people self-medicate with alcohol or food (see my Emotional Eating page). There is a better way though. The bottom line is that all these issues are very treatable and you don’t need to be feeling like this. Please reach out for help and support. Life doesn’t need to be this hard. I already feel like I don’t have enough hours in the day to take care of everything I have to do. I just don’t see how I could fit therapy in. Although you are extremely busy and overwhelmed right now, it’s very important that you make time for yourself and your needs in order to be able to enjoy your life. Specialized therapy will offer you the support you need to get through this and will help you move on with your life. You don’t need to be stuck with these difficult feelings. Perhaps I should just try medication first, I can’t believe I will get better by just talking? Talk therapies have been proven to be effective at alleviating anxiety symptoms in hundreds of research studies conducted around the world. For mild to moderate anxiety, talk therapy has been shown to be more effective than medication and does not have intrusive negative physical side effects. A particular type of talk therapy called Cognitive Behavior Therapy (CBT) has been proven to successfully treat anxiety and in many studies patients treated with CBT are more likely to get better and have fewer symptoms of anxiety. And not just by the end of therapy, many studies have reported that patients using therapy rather than medication show more positive improvements at 12 months and longer post therapy. I have 20 years experience of using CBT which allows me to get to the root of problems quickly and show you practical ways to feel more in control of your life. If you are experiencing severe anxiety though there is absolutely nothing wrong in seeking treatment that uses both antidepressants (they work for both depression and anxiety) and talk therapy. When I work with someone who can see that the coping strategies we are talking about in therapy are a great idea but their anxiety levels makes it too hard for them to carry them out, I often suggest having a consultation with a psychiatrist. Used together, therapy and medication can really work well in lifting you to a place where you can utilize the strategies we are discussing. We can then work on making worrying less your normal state of being and after a while you will probably be able to reduce and then stop the medication. You will be thinking and behaving differently so won’t need it anymore. There is nothing scary about meeting with me. You know yourself better than anyone else. At your own pace, you can tell me what has been going on in your life and together we will get to the sources of the issues you are facing. I have many years of experience and between us we will be able figure out the best way to move forward. Although we will talk a little about the past so we know how you have got to the place you are now, our focus will be in the present and how to help you develop the tools you need to worry less and start enjoying your life. There are many ways we hold ourselves back from happiness. I can empower you with the tools necessary to deal with the stress that life and relationships bring, both in the present and for when they show up again in the future. Please don’t wait to get help! You don’t have to go through this alone. So I put together a booklet with some strategies I am always giving to my clients to help them begin to improve their mood. I hope that you will find it helpful too. Please let me know if you have any questions after reading the booklet. Also, if you would like to read more, I have several blog posts on my blog about anxiety and other issues that can affect the way you feel. When you feel ready to start working on reducing your anxiety, I can help you overcome worrying in one-on-one individual counseling sessions. Learning skills to manage anxious thoughts and to tackle fears that may have been holding you back. Therapy sessions come with handouts, relaxation CD and strategies and homework tasks between sessions that are individually tailored to your particular worries and concerns. While all your worries won’t disappear, you will be given strategies to manage them better and tools to reduce the impact they have on your life. If you feel anxiety is standing in the way of you leading the life you want to, call me on 847 791-7722 or via the email form below.